In this chapter, we will add the copper fills for the ground and Vcc planes. 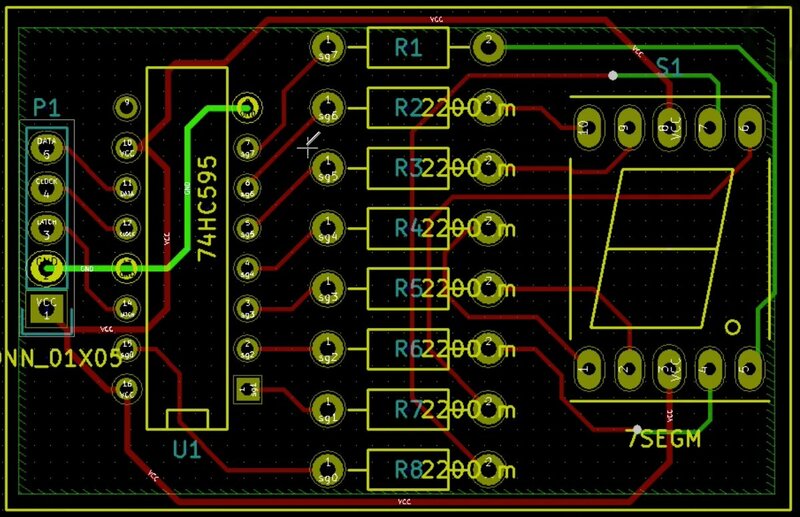 Since we placed the ground tracks in the back copper layer, and the Vcc and data signals on the front copper layer, we will create copper fills in the back and front layers. Let’s start with the bottom layer. 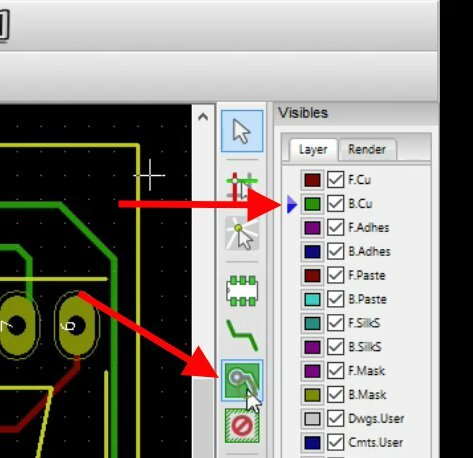 Select the bottom layer “B.Cu” from the Layer chooser. 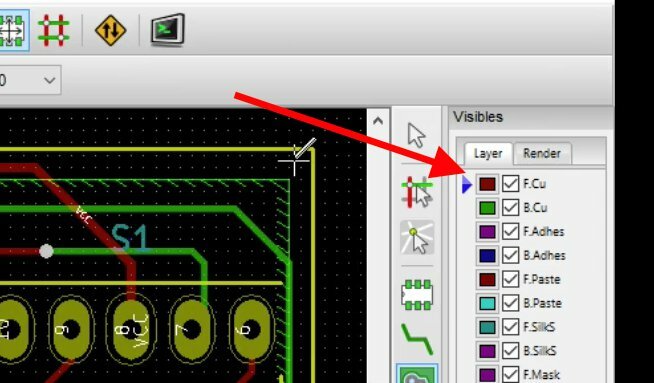 Select the appropriate layer, then enable the copper fills function button. 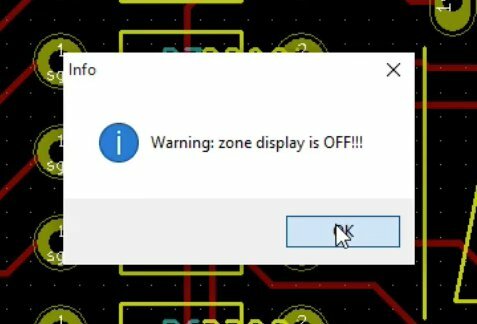 The zone display is OFF. This will make copper layers invisible, so we should turn zone display on. 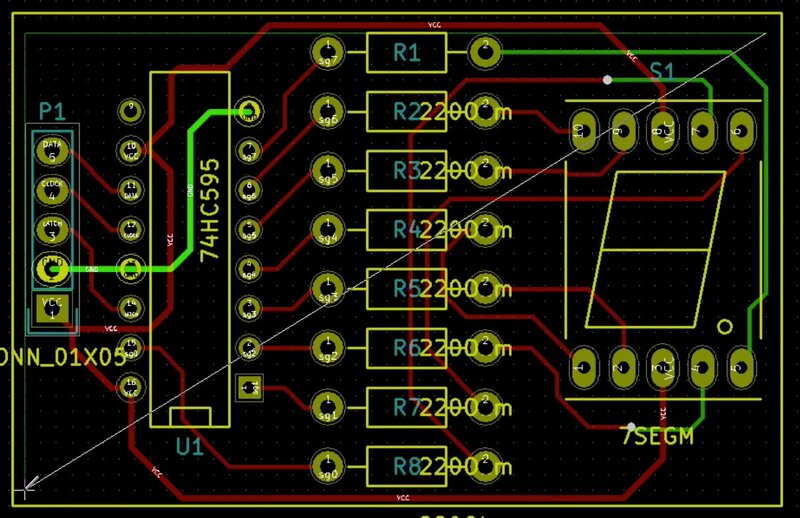 When a PCB is fully populated, routed and filled with copper, it may be difficult to distinguish individual features. You can make the canvas easier to examine by switching off various display features. One of them is the copper fills. This warning is complaining that because the zone display is off, you will be unable to see the new copper fill that you are about to add to the canvas. 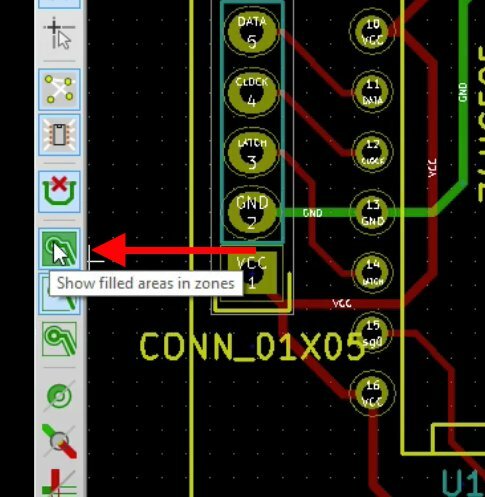 To enable the zone display, click on the “Show field areas in zones” button from the left vertical tool bar. 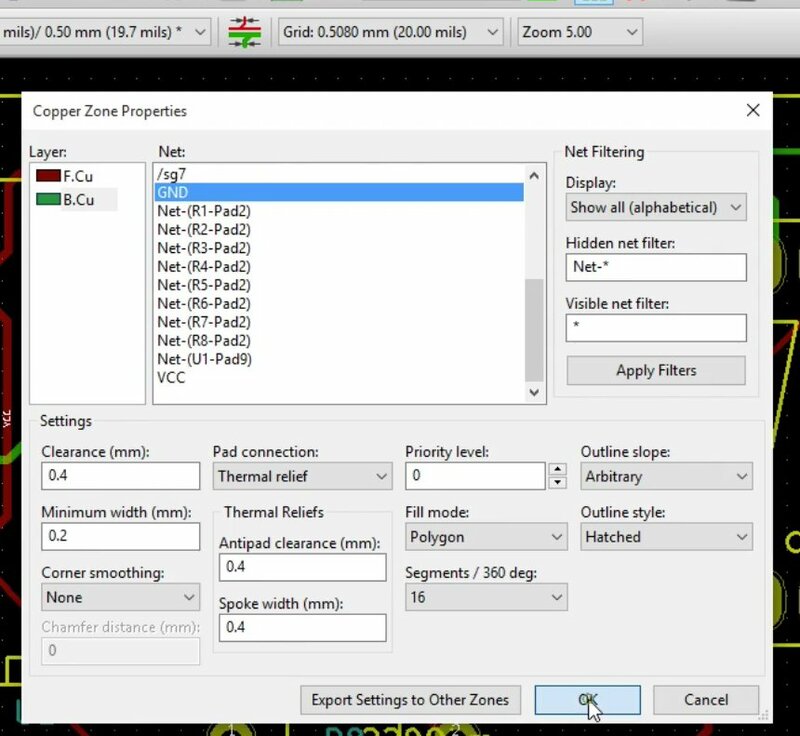 To make copper fills visible, click on the “Show filled areas in zones” button. The two buttons below it control the visibility of other canvas features. Toggle them on and off to see what they do! 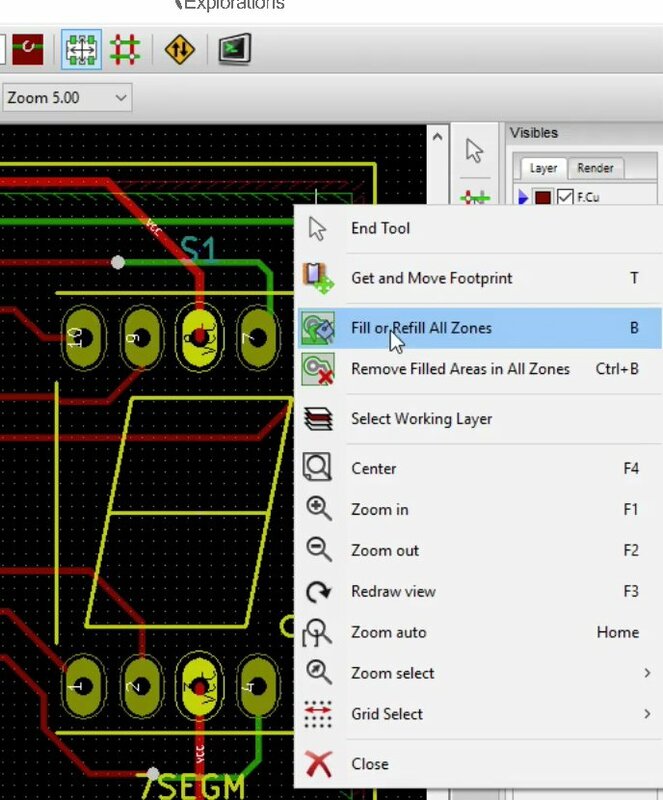 With the zone display on, B.Cu layer selected, and copper fills function enabled, start drawing the copper fill region. Click at the top right corner to start drawing. The Copper Zone Properties window will show up. The B.Cu layer is already selected in the Layer list. In the Net list, look for the GND net and click on it to choose it. 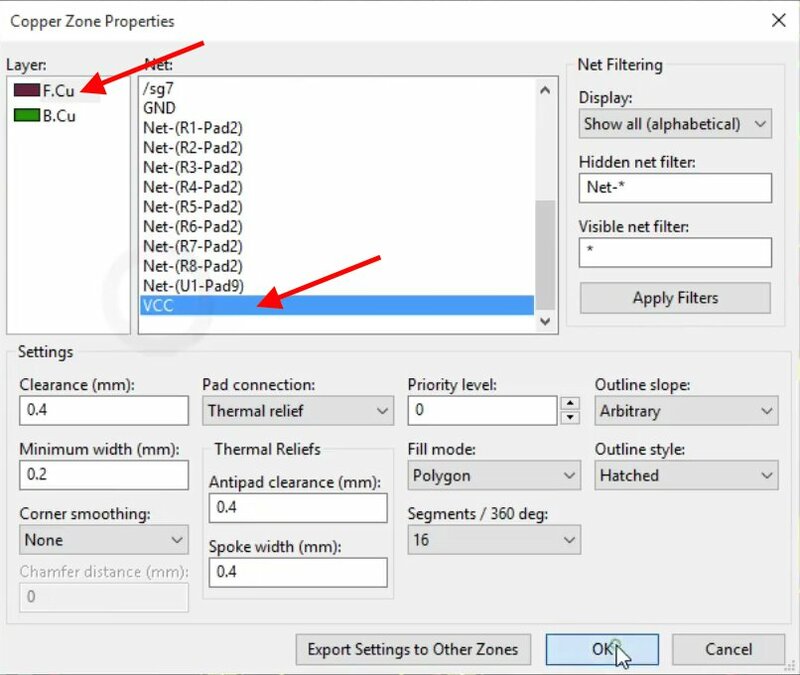 To add a copper fill in the bottom layer for the GND net, select the layer and net from the Copper Zone Properties window. Also notice the Grid setting (0.508) in the drop-down menu above the properties window. Click OK to dismiss the properties window, and start creating the box. A single click will complete an edge, and a double click will finish the box. Double-click at the first corner of the box to complete the fill. Move to the front copper layer. F.Cu will be already selected. Choose the VCC net, and click OK. The front layer copper fill box is complete. Notice the thin red line outlining it. To fill all zones, right click anywhere inside the zone and select “Fill or Refill All Zones”. 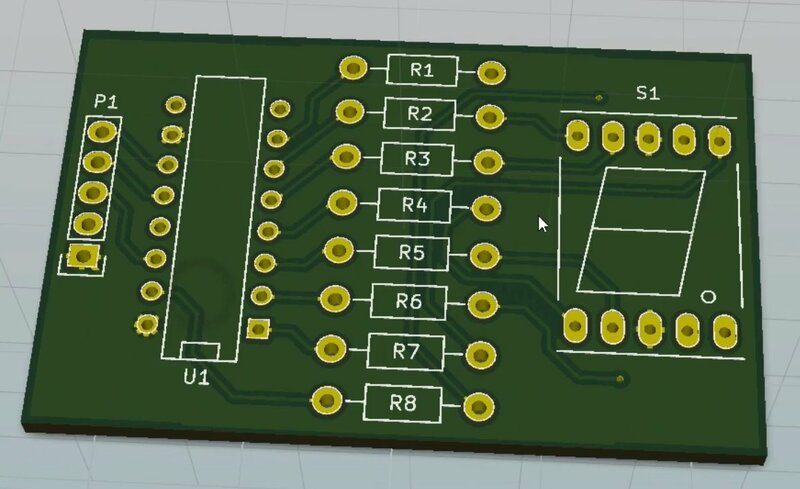 Our PCB, with its fill zones filled with virtual copper. A 3D rendering of the front layer. Notice that the areas filled with copper have the same shade of green as a normal track. Darker green indicates an area that has no copper. The back layer, almost completely covered with copper. 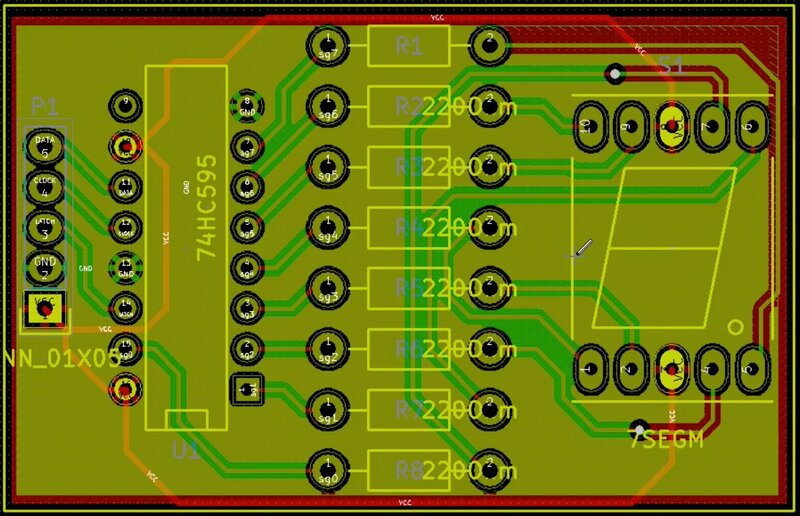 I like to preview a 3D rendering of the front and back layers before doing any more work, in order to visually inspect the board. It is also a good practice to do regular DRCs. In my case, there were no errors, which is how I like it! Small but important details: pins 8, 9 and 10. 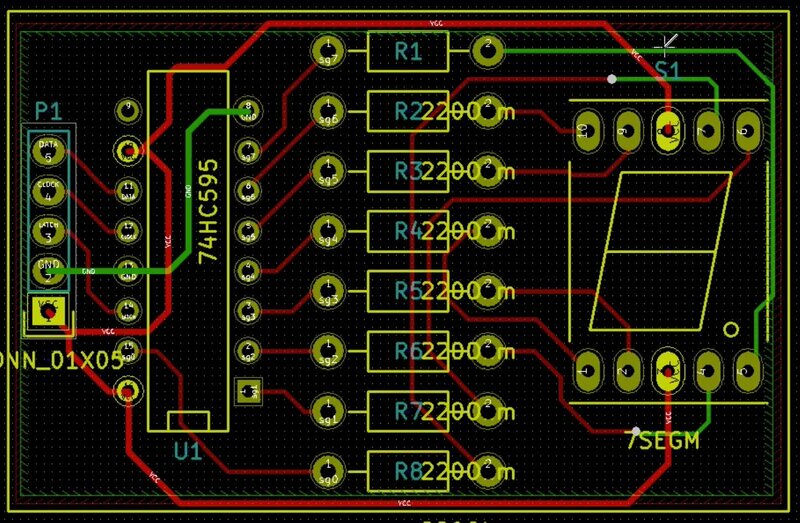 Notice how pin 9, which in Eeschema we marked as “unconnected” is actually not connected to anything in Pcbnew. 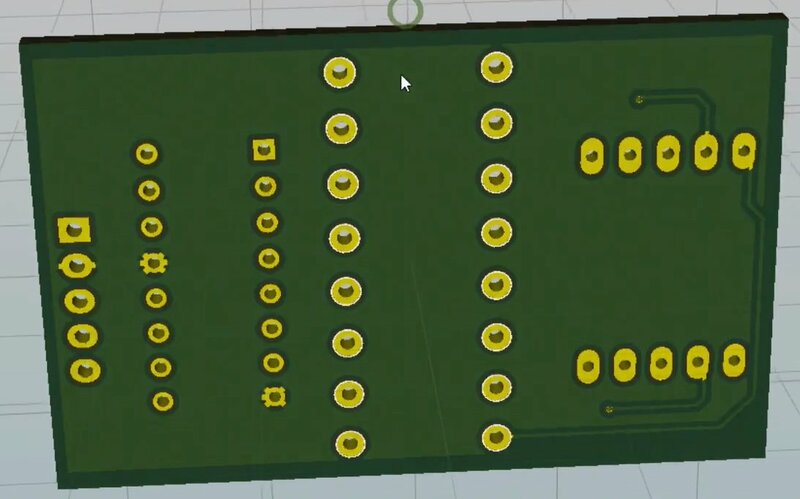 Thermal reliefs were also added to pins 8 and 10, GND and Vcc respectively, since we chose to connect these nets to the back and front layer copper fills. 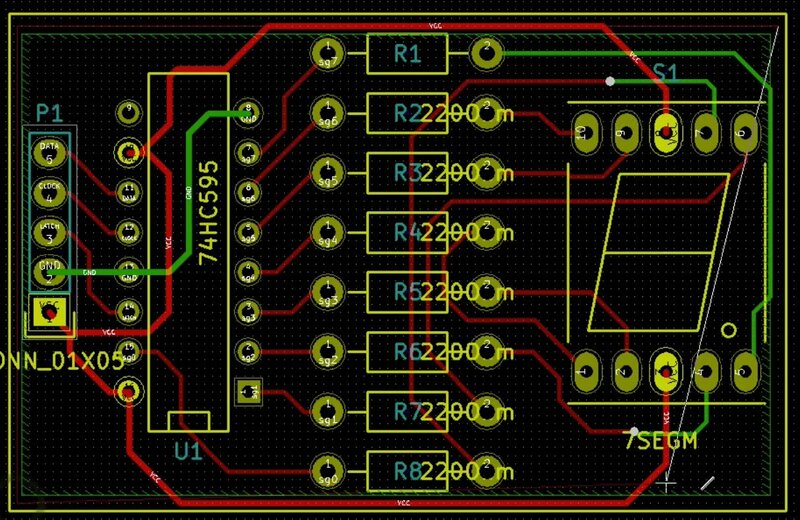 The bulk of the layout and wiring work is complete. In the next lecture we will add text labels in the silkscreen layer.